Groovorio.com is a search engine which is set as your default search provider and home page if you pay no attention to the installation process of a program called Groovorio. The program is a browser add-on, and it is compatible with Internet Explorer, Google Chrome, and Mozilla Firefox. The Groovorio program is promoted at getgroovorio.com; however, the website contains no download button. The browser plug-in is available on Chrome Web Store and may be bundled with other free programs. The Groovorio program is aimed at helping you access your favorite websites in no time. It enables you to customize your new browser tabs by filling them with links to various websites, including Facebook, YouTube, Twitter, Booking.com, Amazon, eBay, and many other websites. The Groovorio adware program may also provide you with third-party advertisements, which you should ignore if you want to avoid unreliable websites. We recommend that you ignore those ads because IronSource is not liable for third-parties; the company has no control over the activities of the sponsors of the program, which means that you interact with Groovorio advertisements at your own risk. Groovorio.com is known to use the advertisement hosting server adclick.g.doubleclick.net, which is commonly used by other search engine and adware programs. As regards the search engine Groovorio.com, it is important to note that the changes within your browsers can be prevented. If you do no deselect three check boxes, get ready for various advertisements and sponsored links. The startup page of the search engine displays advertisements that have nothing to do with your earlier search terms and present browsing interests. In order to get rid of all those advertisements and sponsored links displayed on the search engine results page, remove Groovorio.com from the computer and make sure that the operating system is properly protected against malware and spyware. We recommend that you remove Groovorio.com from the computer using a powerful spyware removal tool because after uninstalling the Groovorio adware, no changes are made within your browsers, and you have to restore your former settings manually. Below you will find our step-by-step instructions on how to remove Groovorio.com, but we advise you to implement SpyHunter. 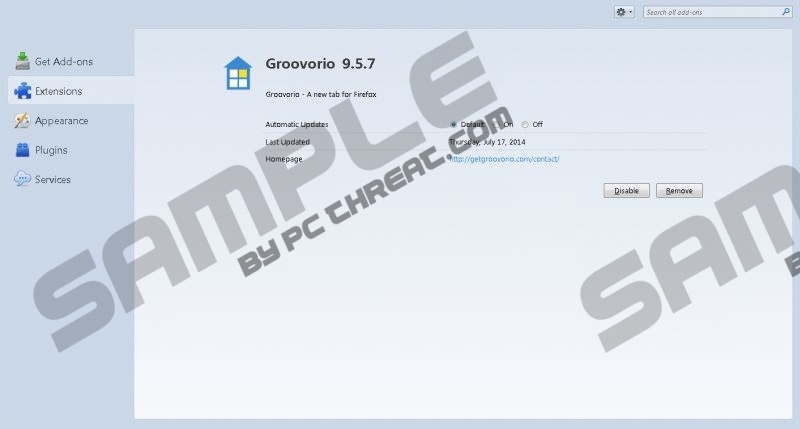 In case you are determined to remove Groovorio.com manually, scan the computer after removing the program to make sure that all the components of the adware program are deleted. Make sure that the Toolbar and Extensions section contains no unwanted extensions. In the Search Providers section, set a new default search provider. Change the home page on the General tab and click OK.
Alt+F and point to Tools. Click Extensions and remove unwanted extensions. Click Settings on the left side of the browser window. Under On Startup, select the last option and click Set pages. Quick & tested solution for Groovorio.com removal. My opinion is that by using devious tactics to install unwanted software on user's computers is unforgivable, particularly when companies such as Adobe do it with every new "version" of their software. So when Groovio showed up all over the damned place after my kid installed a well known (and previously respected) PDF tool called CutePDF I was more than unhappy. Thanks for providing instructions on how to remove it. Can you Help me to install Groovorio Search page ??? where can I download installation with this search Hijacker? Help me with it please, really need it! When trying to uninstall Groovorio, it says that I need to close down browsers. Problem is that I do not have any browsers open... Help please!!! Never wanted you service in the first place.